While attending Ramblin Man Fair last weekend in Kent, I had a brief opportunity to catch up again with Singer/Keyboardist Darren Wharton of Thin Lizzy/Dare just before he was due to go on stage. Darren discussed the Lizzy anniversary shows, the success of the recent Dare album, and future plans, including an exclusive surprise for Dare fans. I opened by asking Darren how the “special guests” – Tom Hamilton (Aerosmith) and Scott Travis (Judas Priest) – had slotted into the band. Absolutely fantastic. Tom is brilliant and has slotted very naturally into the band and it sounds great. Scott Travis on drums is doing a fantastic job. How did you come to pick those guys to join Thin Lizzy for the anniversary shows? Well, Damon actually knows Tom, he has been friends with him forever. He just rang him up and said “How do you fancy doing this Thin Lizzy – 30 years since Phil’s death”? So he jumped at the chance. The network of rock and roll? Yes. We were pleased at that. Regarding the setlist for these anniversary shows, will fans be able to hear some different and maybe some rarely played live numbers? I have seen the band several times in recent years. Will it be a different setlist? I don’t think that it is anything different Mark. Just classics that everybody wants to hear really. Depending on which shows that you see we have a few different. We have “Angel of death” in there, and “Killer on the Loose,” “Massacre” – all the old favourites really. I know it’s a “Thin Lizzy” interview, but would it be ok to also discuss Dare with you? Congratulations on such a great album. Well done! It’s certainly been worth the wait. And reviews have been universally excellent. Thank you, bloody hell we have gone to number 1 in four countries now. Number 5 in the official rock charts in the UK. Bigger now than the band even were in the eighties? On the Amazon rock charts, we are number one in Germany, Italy, Spain, and UK the same. It’s gone great. I am surprised better than I expected. I don’t think that we had the Facebook thing before. We have been able to reach out to a lot of fans that have been there all the time. To be able to have the greater exposure of that has been great. So with this newfound commercial success for Dare, can we expect some more live dates in the near future? We are playing a festival in Spain next month. We have one more show with Lizzy in Sweden next month. One show in Florida in the New Year and that’s it. 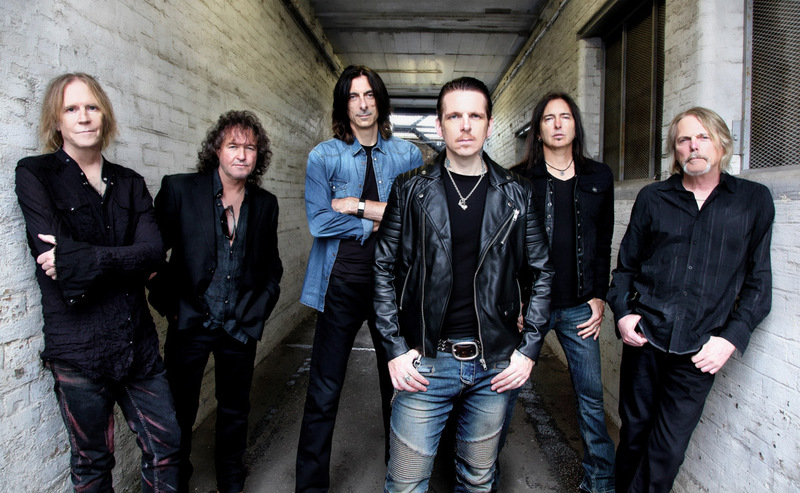 The guys are going to be doing the Black Star Riders thing and I am going to have a new Dare album out. That’s pretty quick and productive. Well, we are actually going to re-record Out of the Silence. Why? It’s a classic album and still sounds great. Well, it is but I can certainly sing it a hundred times better now. I totally agree during the early Lizzy days and even Dare you were recognised more as a keyboardist than a vocalist. You have certainly improved as a singer over the years. (laughs) Yeah, I have certainly earned my stripes! You have been involved in the music business now for quite some time. What are the major differences that you have seen since joining Thin Lizzy as a young eighteen-year-old? What I think now is the ability to reach people like I say, you don’t have to rely on the big major labels anymore. You don’t have to rely on the magazines. You can have a hands-on approach and you can reach the fans without having to go through the middle man. That has been great for many bands and I am pleased about that. Viewing your musical back catalogue, are there any releases that you now disown? Do you ever get the opportunity at festivals to check out other bands on the bill, or does the hectic schedule not allow for that? Well yeah, I watched Whitesnake the other night and I am going to try and see Uriah Heep. I then pointed out to Darren that was my major dilemma of the weekend that Thin Lizzy and Uriah Heep clashed schedule-wise. Yes, a lot of these festivals have that problem. We played in Germany last week and Slayer were on. We had a full house so it was good. Do you feel that fame comes at a price? Do you not get fed up being recognised? I don’t get recognised all the time. Now and again, yes. It’s not a bad thing. Do you still have unfulfilled hopes/dreams and ambitions? Yeah, a number 1 for Dare and getting playlisted on Radio 2 (laughs). Just wrapping things up with a final question. Who would you like to personally interview, Darren? Ahh, Robert De Niro. I am a big fan of his films. Thanks very much, Darren. Great to catch up with you again. Looking forward to seeing Lizzy again later today. Great to see you, Mark. Take care.